Here's a list of universities with arguably the greatest computer science programs: Carnegie Mellon, MIT, UC Berkeley, and Stanford. These are the same places, respectively, where Andrew Ng received his bachelor's degree, his master's, his Ph.D., and has taught for 12 years. Ng is an icon of the artificial intelligence world with the pedigree to match, and he is not yet 40 years old. In 2011, he founded Google Brain, a deep-learning research project supercharged by Google's vast stores of computing power and data. Delightfully, one of its most important achievements came when computers analyzing scores of YouTube screenshots were able to recognize a cat. (The New York Times' headline: "How Many Computers to Identify a Cat? 16,000.") As Ng explained, "The remarkable thing was that [the system] had discovered the concept of a cat itself. No one had ever told it what a cat is. 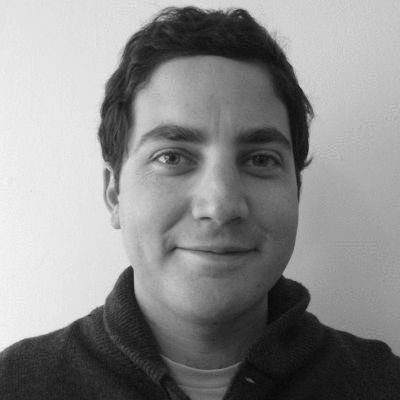 That was a milestone in machine learning." Ng exudes a cheerful but profound calm. He happily discusses the various mistakes and failures of his career, the papers he read but didn't understand. He wears identical blue oxford shirts each and every day. He is blushing but proud when a colleague mentions his adorable robot-themed engagement photo shoot with his now-wife, a surgical roboticist named Carol Reiley (note his shirt in the photo). One-on-one, he speaks with a softer voice than anyone you know, though this has not hindered his popularity as a lecturer. In 2011, when he posted videos from his own Stanford machine learning course on the web, over 100,000 people registered. Within a year, Ng had co-founded Coursera, which is today the largest provider of open online courses. Its partners include Princeton and Yale, top schools in China and across Europe. It is a for-profit venture, though all classes are accessible for free. "Charging for content would be a tragedy," Ng has said. Then, last spring, a shock. 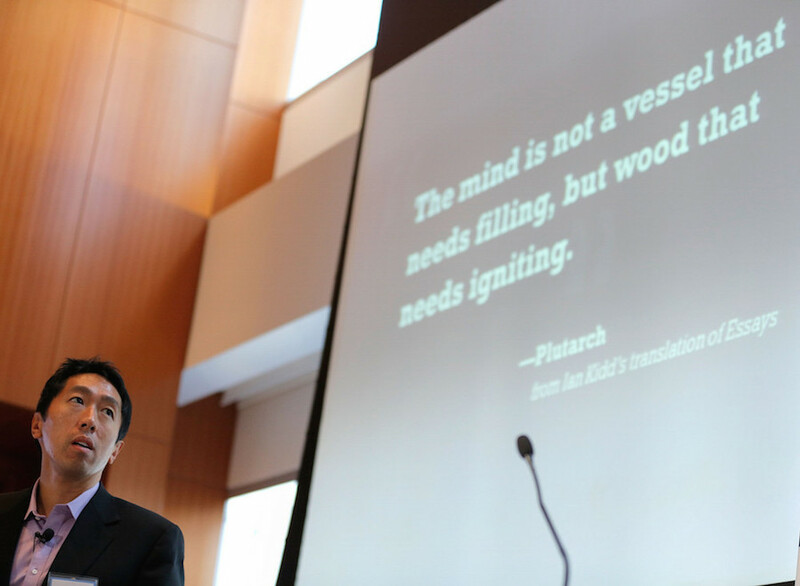 Ng announced he was departing Google and stepping away from day-to-day involvement at Coursera. The Chinese tech giant Baidu was establishing an ambitious $300 million research lab devoted to artificial intelligence just down the road from Google's Silicon Valley headquarters, and Andrew Ng would head it up. At Baidu, as before, Ng is trying to help computers identify audio and images with incredible accuracy, in realtime. (On Tuesday, Baidu announced it had achieved the world's best results on a key artificial intelligence benchmark related to image identification, besting Google and Microsoft.) Ng believes speech recognition with 99 percent accuracy will spur revolutionary changes to how humans interact with computers, and how operating systems are designed. Simultaneously, he must help Baidu work well for the millions of search users who are brand new to digital life. "You get queries [in China] that you just wouldn’t get in the United States," Ng explained. "For example, we get queries like, 'Hi Baidu, how are you? I ate noodles at a corner store last week and they were delicious. Do you think they’re on sale this weekend?' That’s the query." Ng added: "I think we make a good attempt at answering." Elon Musk and Stephen Hawking have been sounding alarms over the potential threat to humanity from advanced artificial intelligence. Andrew Ng has not. "I don't work on preventing AI from turning evil for the same reason that I don't work on combating overpopulation on the planet Mars," he has said. AI is many decades away (if not longer) from achieving something akin to consciousness, according to Ng. In the meantime, there's a far more urgent problem. Computers enhanced by machine learning are eliminating jobs long done by humans. The trend is only accelerating, and Ng frequently calls on policymakers to prepare for the socioeconomic consequences. At Baidu's new lab in Sunnyvale, Calif., we spoke to Andrew Ng for Sophia, a HuffPost project to collect life lessons from fascinating people. He explained why he thinks "follow your passion" is terrible career advice and he shared his strategy for teaching creativity; Ng discussed his failures and his helpful habits, the most influential books he's read, and his latest thoughts on the frontiers of AI. You recently said, "I’ve seen people learn to be more creative." Can you explain? The question is, how does one create new ideas? Is it those unpredictable lone acts of genius, people like Steve Jobs, who are special in some way? Or is it something that can be taught and that one can be systematic about? I believe that the ability to innovate and to be creative are teachable processes. There are ways by which people can systematically innovate or systematically become creative. One thing I've been doing at Baidu is running a workshop on the strategy of innovation. The idea is that innovation is not these random unpredictable acts of genius, but that instead one can be very systematic in creating things that have never been created before. In my own life, I found that whenever I wasn't sure what to do next, I would go and learn a lot, read a lot, talk to experts. 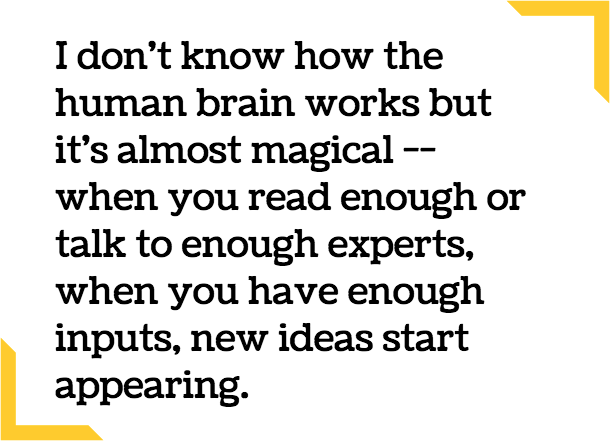 I don't know how the human brain works but it's almost magical: when you read enough or talk to enough experts, when you have enough inputs, new ideas start appearing. This seems to happen for a lot of people that I know. When you become sufficiently expert in the state of the art, you stop picking ideas at random. You are thoughtful in how to select ideas, and how to combine ideas. You are thoughtful about when you should be generating many ideas versus pruning down ideas. Now there is a challenge still -- what do you do with the new ideas, how can you be strategic in how to advance the ideas to build useful things? That's another whole piece. Can you talk about your information diet, how you approach learning? I read a lot and I also spend time talking to people a fair amount. I think two of the most efficient ways to learn, to get information, are reading and talking to experts. So I spend quite a bit of time doing both of them. I think I have just shy of a thousand books on my Kindle. And I've probably read about two-thirds of them. At Baidu, we have a reading group where we read about half a book a week. I'm actually part of two reading groups at Baidu, each of which reads about half a book a week. I think I'm the only one who's in both of those groups [laughter]. And my favorite Saturday afternoon activity is sitting by myself at home reading. Let me ask about your early influences. Is there something your parents did for you that many parents don't do that you feel had a lasting impact on your life? I think when I was about six, my father bought a computer and helped me learn to program. A lot of computer scientists learned to program from an early age, so it's probably not that unique, but I think I was one of the ones that was fortunate to have had a computer and could learn to start to program from a very young age. Unlike the stereotypical Asian parents, my parents were very laid back. Whenever I got good grades in school, my parents would make a fuss, and I actually found that slightly embarrassing. So I used to hide them. [Laughter] I didn't like showing my report card to my parents, not because I was doing badly but because of their reaction. I was also fortunate to have gotten to live and work in many different places. I was born in the U.K., raised in Hong Kong and Singapore, and came to the U.S. for college. Then for my own studies, I have degrees from Carnegie Mellon, MIT, and Berkeley, and then I was at Stanford. I was very fortunate to have moved to all these places and gotten to meet some of the top people. I interned at AT&T Bell Labs when it existed, one of the top labs, and then at Microsoft Research. I got to see a huge diversity of points of view. Is there anything about your education or your early career that you would have done differently? Any lessons you've learned that people could benefit from? I wish we as a society gave better career advice to young adults. I think that "follow your passion" is not good career advice. It's actually one of the most terrible pieces of career advice we give people. If you are passionate about driving your car, it doesn't necessarily mean you should aspire to be a race car driver. In real life, "follow your passion" actually gets amended to, "Follow your passion of all the things that happen to be a major at the university you're attending." But often, you first become good at something, and then you become passionate about it. And I think most people can become good at almost anything. So when I think about what to do with my own life, what I want to work on, I look at two criteria. The first is whether it's an opportunity to learn. Does the work on this project allow me to learn new and interesting and useful things? The second is the potential impact. The world has an infinite supply of interesting problems. 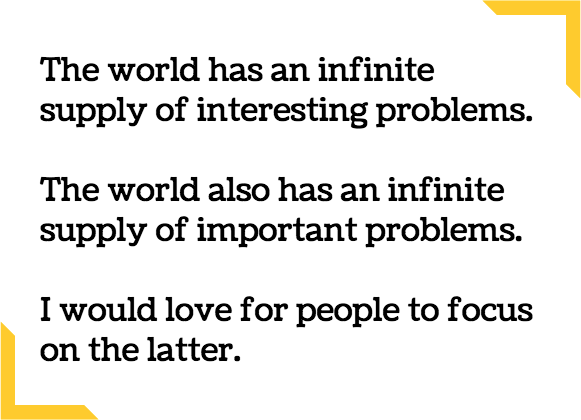 The world also has an infinite supply of important problems. I would love for people to focus on the latter. I've been fortunate to have repeatedly been able to find opportunities that had a lot of potential for impact and also gave me fantastic opportunities to learn. I think young people optimizing for these two things will often have the best careers. Our team here has a mission of developing hard AI technologies, advanced AI technologies that let us impact hundreds of millions of users. That's a mission I'm genuinely excited about. Do you define importance primarily by the number of people who are impacted? No, I don't think the number is the only thing that's important. Changing hundreds of millions of people's lives in a significant way, I think that's the level of impact that we can reasonably aspire to. That is one way of making sure we do work that isn't just interesting, but that also has an impact. You've talked previously about projects of yours that have failed. How do you respond to failure? Well, it happens all the time, so it's a long story. [Laughter] A few years ago, I made a list in Evernote and tried to remember all the projects I had started that didn't work out, for whatever reason. Sometimes I was lucky and it worked out in a totally unexpected direction, through luck rather than skill. But I made a list of all the projects I had worked on that didn't go anywhere, or that didn't succeed, or that had much less to show for it relative to the effort that we put into it. Then I tried to categorize them in terms of what went wrong and tried to do a pretty rigorous post mortem on them. So, one of these failures was at Stanford. For a while we were trying to get aircraft to fly in formation to realize fuel savings, inspired by geese flying in a V-shaped formation. The aerodynamics are actually pretty solid. So we spent about a year working on making these aircraft fly autonomously. Then we tried to get the airplanes to fly in formation. But after a year of work, we realized that there is no way that we could control the aircraft with sufficient accuracy to realize fuel savings. Now, if at the start of the project we had thought through the position requirements, we would have realized that with the small aircraft we were using, there is just no way we could do it. Wind gusts will blow you around far more than the precision needed to fly the aircraft in formation. So one pattern of mistakes I've made in the past, hopefully much less now, is doing projects where you do step one, you do step two, you do step three, and then you realize that step four has been impossible all along. I talk about this specific example in the strategy innovation workshop I talked about. The lesson is to de-risk projects early. I've become much better at identifying risks and assessing them earlier on. Now when I say things like, "We should de-risk a project early," everyone will nod their head because it's just so obviously true. But the problem is when you're actually in this situation and facing a novel project, it's much harder to apply that to the specific project you are working on. The reason is these sorts of research projects, they're a strategic skill. In our educational system we're pretty good at teaching facts and procedures, like recipes. How do you cook spaghetti bolognese? You follow the recipe. We’re pretty good at teaching facts and recipes. But innovation or creativity is a strategic skill where every day you wake up and it's a totally unique context that no one's ever been in, and you need to make good decisions in your completely unique environment. So as far as I can tell, the only was we know way to teach strategic skills is by example, by seeing tons of examples. The human brain, when you see enough examples, learns to internalize those rules and guidelines for making good strategic decisions. Very often, what I find is that for people doing research, it takes years to see enough examples and to learn to internalize those guidelines. So what I've been experimenting with here is to build a flight simulator for innovation strategy. Instead of having everyone spend five years before you see enough examples, to deliver many examples in a much more compressed time frame. Just as in a flight simulator, if you want to learn to fly a 747, you need to fly for years, maybe decades, before you see any emergencies. But in a flight simulator, we can show you tons of emergencies in a very compressed period of time and allow you to learn much faster. Those are the sorts of things we've been experimenting with. When this lab first opened, you noted that for much of your career you hadn't seen the importance of team culture, but that you had come to realize its value. Several months in, is there anything you've learned about establishing the right culture? A lot of organizations have cultural documents like, "We empower each other," or whatever. When you say it, everyone nods their heads, because who wouldn't want to empower your teammates. But when they go back to their desks five minutes later, do they actually do it? It's difficult for people to bridge the abstract and the concrete. At Baidu, we did one thing for the culture that I think is rare. I don't know of any organization that has done this. We created a quiz that describes to employees specific scenarios -- it says, "You're in this situation and this happens. What do you do: A, B, C, or D?" No one has ever gotten full marks on this quiz the first time out. I think the quiz interactivity, asking team members to apply specifics to hypothetical scenarios, has been our way of trying to connect the abstract culture with the concrete; what do you actually do when a teammate comes to you and does this thing? What are some books that had a substantial impact on your intellectual development? Recently I've been thinking about the set of books I'd recommend to someone wanting to do something innovative, to create something new. 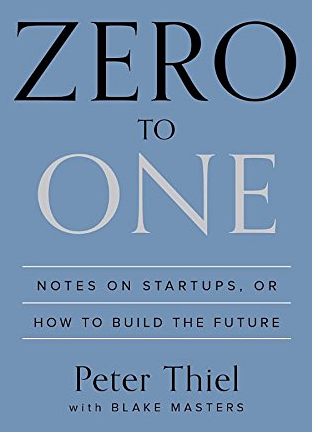 The first is "Zero to One" by Peter Thiel, a very good book that gives an overview of entrepreneurship and innovation. We often break down entrepreneurship into B2B ("business to business," i.e., businesses whose customers are other businesses) and B2C ("business to consumer"). For B2B, I recommend "Crossing the Chasm." For B2C, one of my favorite books is "The Lean Startup," which takes a narrower view but it gives one specific tactic for innovating quickly. It's a little narrow but it's very good in the area that it covers. Then to break B2C down even further, two of my favorites are "Talking to Humans," which is a very short book that teaches you how to develop empathy for users you want to serve by talking to them. Also, "Rocket Surgery Made Easy." If you want to build products that are important, that users care about, this teaches you different tactics for learning about users, either through user studies or by interviews. Then finally there is "The Hard Thing about Hard Things." It's a bit dark but it does cover a lot of useful territory on what building an organization is like. For people who are trying to figure out career decisions, there's a very interesting one: "So Good They Can't Ignore You." That gives a valuable perspective on how to select a path for one's career. Do you have any helpful habits or routines? I wear blue shirts every day, I don't know if you know that. [laughter] Yes. One of the biggest levers on your own life is your ability to form useful habits. When I talk to researchers, when I talk to people wanting to engage in entrepreneurship, I tell them that if you read research papers consistently, if you seriously study half a dozen papers a week and you do that for two years, after those two years you will have learned a lot. This is a fantastic investment in your own long term development. But that sort of investment, if you spend a whole Saturday studying rather than watching TV, there's no one there to pat you on the back or tell you you did a good job. Chances are what you learned studying all Saturday won't make you that much better at your job the following Monday. There are very few, almost no short-term rewards for these things. But it's a fantastic long-term investment. This is really how you become a great researcher, you have to read a lot. People that count on willpower to do these things, it almost never works because willpower peters out. Instead I think people that are into creating habits -- you know, studying every week, working hard every week -- those are the most important. Those are the people most likely to succeed. For myself, one of the habits I have is working out every morning for seven minutes with an app. I find it much easier to do the same thing every morning because it's one less decision that you have to make. It's the same reason that my closet is full of blue shirts. I used to have two color shirts actually, blue and magenta. I thought that's just too many decisions. [Laughter] So now I only wear blue shirts. You've urged policymakers to spend time thinking about a future where computing and robotics have eliminated some substantial portion of the jobs people have now. Do you have any ideas about possible solutions? It's a really tough question. Computers are good at routine repetitive tasks. Thus far, the main things that computers have been good at automating are tasks where you kind of do the same thing day after day. Now this can be at multiple points on the spectrum. Humans work on an assembly line, making the same motion for months on end, and now robots are doing some of that work. A midrange challenge might be truck-driving. Truck drivers do very similar things day after day, so computers are trying to do that too. It's harder than most people think, but automated driving might happen in the next decade or so, we don't know. Then, even higher-end things, like some radiologists read the same types of x-rays over and over each day. Again, computers may have traction in those areas. But for the social tasks which are non-routine and non-repetitive, those are the tasks that humans will be better at than computers for quite a period of time, I think. In many of our jobs we do different things every day. We meet different people, we have to arrange different things, solve problems differently. Those things are relatively difficult for computers to do, for now. The challenge that faces us is that, when the U.S. transformed from an agricultural to a manufacturing and services economy, we had people move from one routine task, such as farming, to a different routine task, such as manufacturing or working call service centers. A large fraction of the population has made that transition, so they've been okay, they've found other jobs. But many of their jobs are still routine and repetitive. The challenge that faces us is to find a way to scalably teach people to do non-routine non-repetitive work. Our education system, historically, has not been good at doing that at scale. The top universities are good at doing that for a relatively modest fraction of the population. But a lot of our population ends up doing work that is important but also routine and repetitive. That's a challenge that faces our educational system. I think it can be solved. That's one of the reasons why I've been thinking about teaching innovation strategy, teaching creativity strategy. We need to enable a lot of people to do non-routine, non-repetitive tasks. These tactics for teaching innovation and creativity, these flight simulators for innovation, could be one way to get there. I don't think we've figured out yet how to do it, but I'm optimistic it can be done. You've said, "Engineers in China work much harder than the average Silicon Valley engineer. Engineers in Silicon Valley at startups work really hard. At mature companies, I don’t see the same intensity as you do in startups and at Baidu." Why do you think that is? I don't know. I think the individual engineers in China are great. The individual engineers in Silicon Valley are great. The difference I think is the company. The teams of engineers at Baidu tend to be incredibly nimble. There is much less appreciation for the status quo in the Chinese internet economy and I think there's a much bigger sense that all assumptions can be challenged and everything is up for grabs. The Chinese internet ecosystem is very dynamic. Everyone sees huge opportunity, everyone sees massive competition. Stuff changes all the time. New inventions arise, and large companies will one day suddenly jump into a totally new business sector. To give you an idea, here in the United States, if Facebook were to start a brand new web search engine, that might feel like a slightly strange thing to do. Why would Facebook build a search engine? It's really difficult. But that sort of thing is much more thinkable in China, where there is more of an assumption that there will be new creative business models. This seems to suggests a different management culture, where you can make important decisions quickly and have them be intelligent and efficient and not chaotic. Is Baidu operating in a unique way that you feel is particularly helpful to its growth? Gosh, that's a good question. I'm trying to think what to point to. I think decision making is pushed very far down in the organization at Baidu. People have a lot of autonomy, and they are very strategic. One of the things I really appreciate about the company, especially the executives, is there's a very clear-eyed view of the world and of the competition. When executives meet, and the way we speak with the whole company, there is a refreshing absence of bravado. The statements that are made internally -- they say, "We did a great job on that. We're not so happy with those things. This is going well. This is not going well. These are the things we think we should emphasize. And let's do a post-mortem on the mistakes we made." There's just a remarkable lack of bravado, and I think this gives the organization great context on the areas to innovate and focus on. You're very focused on speech recognition, among other problems. What are the challenges you're facing that, when solved, will lead to a significant jump in the accuracy of speech recognition technology? We're building machine learning systems for speech recognition. Some of the machine learning technologies we're using now have been around for decades. It was only in the last several years that they've really taken off. Why is that? I often make an analogy to building a rocket ship. A rocket ship is a giant engine together with a ton of fuel. Both need to be really big. If you have a lot of fuel and a tiny engine, you won't get off the ground. If you have a huge engine and a tiny amount of fuel, you can lift up, but you probably won't make it to orbit. So you need a big engine and a lot of fuel. The reason that machine learning is really taking off now is that we finally have the tools to build the big rocket engine -- that is giant computers, that's our rocket engine. And the fuel is the data. We finally are getting the data that we need. The digitization of society creates a lot of data and we’ve been creating data for a long time now. But it was just in the last several years we've been finally able to build big enough rocket engines to absorb the fuel. So part of our approach, not the whole thing, but a lot of our approach to speech recognition is finding ways to build bigger engines and get more rocket fuel. For example, here is one thing we did, a little technical. Where do you get a lot of data for speech recognition? One of the things we did was we would take audio data. Other groups use maybe a couple thousand hours of data. We use a hundred thousand hours of data. That is much more rocket fuel than what you see in academic literature. Then one of the things we did was, if we have an audio clip of you saying something, we would take that audio clip of you and add background noise to it, like a clip recorded in a cafe. So we synthesize an audio clip of what you would sound like if you were speaking in a cafe. By synthesizing your voice against lots of backgrounds, we just multiply the amount of data that we have. We use tactics like that to create more data to feed to our machines, to feed to our rocket engines. One thing about speech recognition: most people don't understand the difference between 95 and 99 percent accurate. Ninety-five percent means you get one-in-20 words wrong. That's just annoying, it's painful to go back and correct it on your cell phone. Ninety-nine percent is game changing. If there's 99 percent, it becomes reliable. It just works and you use it all the time. So this is not just a four percent incremental improvement, this is the difference between people rarely using it and people using it all the time. So what is the hurdle to 99 percent at this point? We need even bigger rocket engines and we still need even more rocket fuel. Both are still constrained and the two have to grow together. We're still working on pushing that boundary. Transcription services by Tigerfish; now offering transcripts in two-hours guaranteed. Interview text has been edited and condensed.